Aleethia Foundation wishes to thank Gordon Logan, Founder & CEO of SportClips for hosting the Friday Night Dinner held on June 26 at Tesoro Ristorante, Washington DC. Representatives from SportClips presented T-shirts of NASCAR JGR drivers Denny Hamlin & Carl Edwards, koozies, “free haircut cards” and a Carl Edwards SportClips Crew Hat. Joe Gibbs Racing provided an official die cast of NASCAR #11 autographed by Denny Hamlin and a copy of Joe Gibbs’ book “Game Plan for Life” which he autographed for every service member attending tonight’s dinner. Also, we got to welcome back John Caldwell, Jeff Hensley and Patrick Wickens! It was great to see you all again. 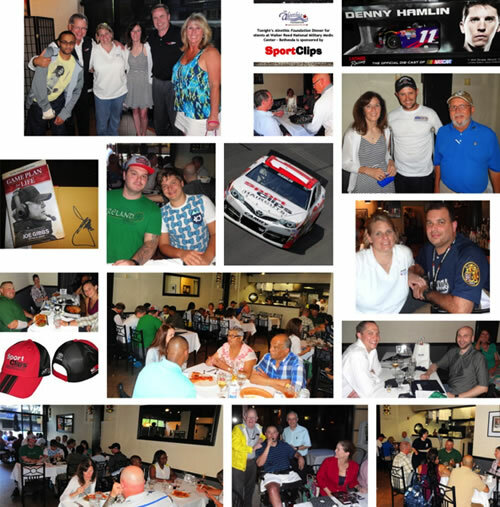 THANK YOU to SportClips for a wonderful fun-filled evening! !